A Volvo wagon (crossover) with style, luxury? YES! Volvo has been a master of wagons for decades, its sturdy boxy 240s setting the standard for boring (yet safe) upscale suburban transport. So it’s no surprise when its tall wagons, the XC crossover vehicles push that bar higher and give the Lexus RX 350 a run for its money. It may surprise you though, that the XC models do so with a good deal of style and luxury. Adios boxy! The tested XC60’s shoulders are broad and well sculpted and the taillights tall and balanced above sensuously curved rear haunches. This is more Venus in ivory than corrugated box, and a welcome styling change. Hop in and let’s go for a ride. While always a premium priced wagon, today’s Volvos push the luxury envelope and driving experience while delivering a bit of punch via the drive train too. Consider the 300-horse V6 that pounds under the hood with twin-scroll turbos to up the torque ante to 325 lb.-ft. Take that Lexus! There is a slight turbo lag, but heavens, once it kicks in, the 4,200-lb. wagon jumps to life, albeit in a satiny-smooth fashion. This is no slouch in the power department and will easily pull 3,300 lbs. The six-speed automatic, with manual shifting option, is seamless and feels perfectly geared to effectively power the all-wheel-drive wagon to highway speeds. And with the AWD, the wagon feels as if it’s on rails with maximum traction even on wet roads coated in leafs. Aiding the car’s luxury feel is a 109.2-inch wheelbase that spreads out road bumps. The test car’s ride was firm and well controlled. Road cracks and bumps are easily dealt with so no one inside is disturbed, yet you don’t feel as if you’re being cushioned too much. I liked the feel and credit the touring ride tuned suspension, with MacPherson struts and coil springs up front and a multi-link rear system with coils and shocks. Handling is fairly precise too. As I said, the XC sticks to the pavement well, but corners flat too and hugs apexes like a sporty sedan. Not sure I’d call this fun, but certainly pleasant and responsive. Gas mileage with the turbo is mediocre, the wagon rated at 17 mpg city and 23 mpg highway. I got just 18.4 mpg in about an even 50-50 mix of city and highway driving. And for you Swede-ophiles this wagon, sadly, is made in Ghent, Belgium, no longer in Sweden. The handsome test crossover was listed as being “seashell metallic” in color, but everyone agreed it was metallic gray. Truth in color naming deteriorates more each year. Ah, but there was nothing downtrodden or misleading about the Volvo’s interior, easily one of the finest I’ve sat in all year. The test car featured a brown over tan leather that was soft and stylish with brown inserts in its tan seats and door panels, plus polished chrome surrounding the center stack down onto the console and trimming parts of the doors and on the tan leather steering wheel’s hub. It wasn’t just the materials, which look rich, but the design and overall layout looks great. Amenities are aplenty too, with the usual power mirrors and sun screen over the panoramic sunroof. 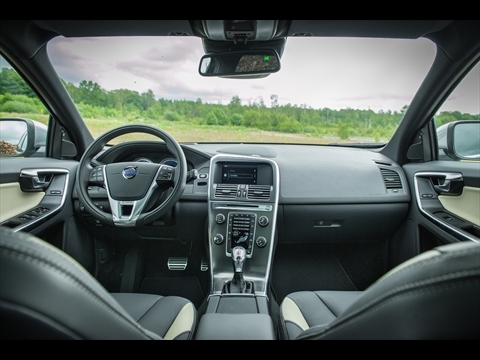 But Volvo puts buttons to open the power rear hatch and fuel filler doors within easy eyesight on the dash’s left, along with an automatic headlight control. Gauges are two simple circles in front of the driver for the tachometer and speedometer, with all the trip computer and gas info displayed digitally in the center of each circular gauge. The trip computer is easily operated by a stalk to the wheel’s left, but oddly this is a manual tilt/telescope wheel. That seems peculiar at the car’s $48,145 asking price. XC60’s seats are power controlled though, with three memory buttons for the driver, plus three levels of seat heat for both front and rear seat passengers. That heat is part of a $900 option package. Head and legroom are generous front and rear and the soft leather seats are well contoured and extremely comfortable. Plus the rear seats fold down for extra cargo room, although there’s a sizable 34.0 cubic feet, even without the seats down. 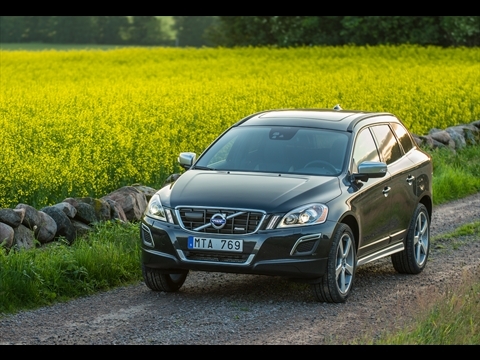 You’ll also like the well insulated, quiet of the XC60’s interior – restful and relaxing. The radio, although it sounds great, is less relaxing. That’s because you must press the “power” button for 5 seconds to turn the radio on or off. Not sure what benefit that delivers as no other automaker does this. Also, there was a glitch in my test car. Twice the radio’s volume did not work when I first started the car in the morning. YES, it was on, but the volume knob only showed it was working on the screen. There was NO sound, until I pulled over and restarted the car. Disturbing! My electro-phobia did not spread to other features. 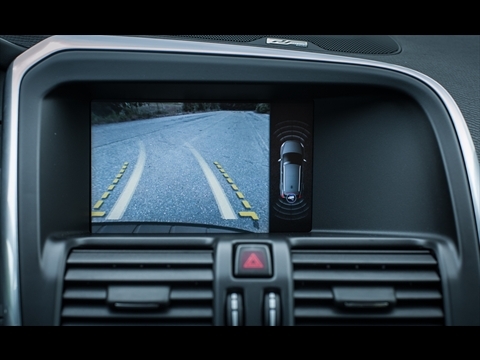 Volvo’s rear park assist is easy to see and works well. I like the park assist camera that helps you see out the back, but get tired of the front and rear assist system beeping when you pull between cars in a parking space. I think we generally can see there’s a car next to us when we are parking. That park assist along with navigation, a premium sound system, HomeLink, active Xenon headlights that help you see around corners and electric fold-down rear headrests are part of a monster $4,600 Platinum package.You can live without much of that, although, I’d like to see the rearview camera as a separate option.Still, at a starting price of $40,450 you expect a fair amount of goodies. This one added in a lot of extras to go beyond $48 grand. Take note that a base XC60 3.2 begins at a somewhat more modest $34,200 and gets 2 mpg better gas mileage. 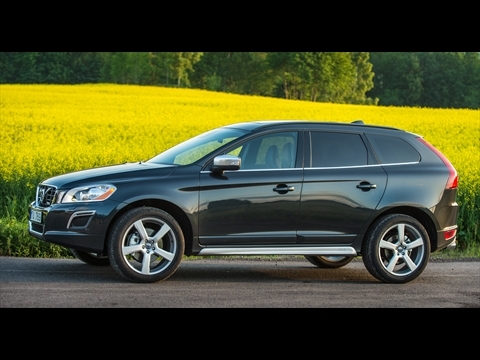 Going all the way to the top-level XC60 T6 R-Design Platinum pushes the entry price to $48,750. 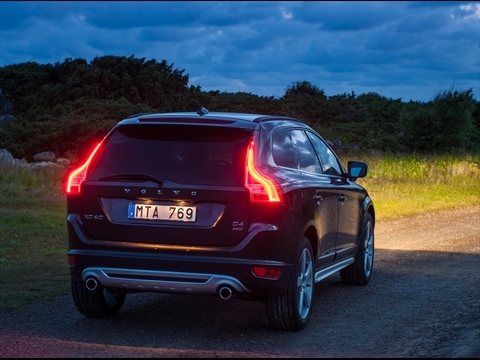 The curved rear fenders and taillights give the Volvo an interesting and stylish tail. Price aside, this was one of the finest driving and riding crossovers or wagons I’ve driven in years, plus it was stylish inside and out. Paint it something other than gray and it’s a winner. Hits: Refined tall wagon with AWD and generous turbo power. Comfortable, stylish quiet interior w/well contoured heated seats, panoramic sunroof and luxury feel. Misses: No power tilt/telescope steering wheel at $48 grand, plus radio had glitch with sound, plus annoying you must hold radio/on off button 5 seconds to activate. See my video review by clicking here.